The Joint Typhoon Warning Center (JTWC) has issued its last warning on Tropical Cyclone Giri after it made landfall earlier today on the coast of Myanmar (formerly Burma). The cyclone, which was a 60 mph tropical storm yesterday morning in the Indian Ocean, had reached the maximum Category 4 level of 155 mph within 24 hours. 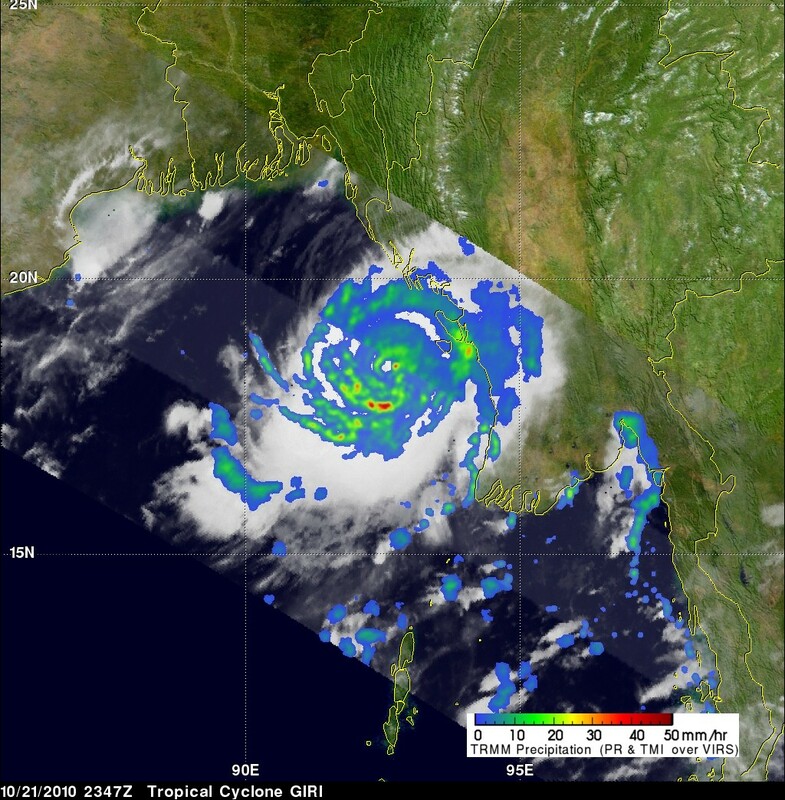 Dr. Jeff Masters of Weather Underground reports that this was the strongest tropical cyclone on record to make landfall on Myanmar. Masters points out that although Giri was 20 mph stronger than devastating Cyclone Nargis in 2008, it fortunately struck a less populated area of the coast. Nargis killed an estimated 138,000 people. NASA reports that the TRMM (Tropical Rainfall Measuring Mission) satellite observed heavy rainfall rates of around 2" per hour before the storm reached maximum strength. One of the favorite memes of the global warming deniosphere is that "It's all just natural cycles." With a strong La Niña expected to follow this winter hard on the heels of last year's strong El Niño, it's reasonable to ask whether these events may be increasing in frequency or intensity. A Twitch from Texas Tech climate scientist Katharine Hayhoe points to an interesting study published in the refereed journal Climate Change: A history of ENSO events since A.D. 1525: implications for future climate change, by J. L. Gergis and A. M. Fowler. 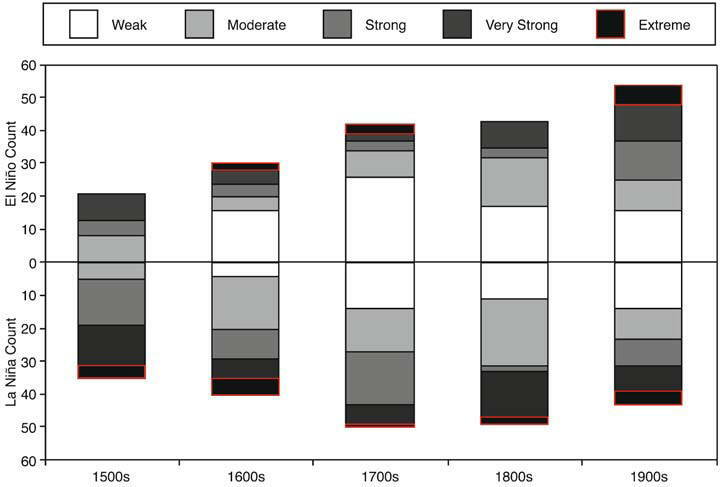 Despite their limitations, reconstructions of past climate are unique in their ability to provide a long-term context for evaluating 20th century climate change. The unusual nature of late 20th century ENSO is evident. The height of La Niña activity occurred during the 16th and 19th centuries, while the 20th century is identified as the peak period of El Niño activity. 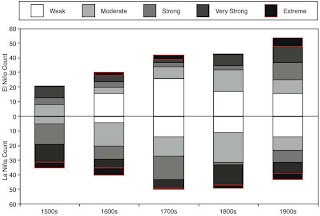 Overall, 55% of extreme El Niño event years reconstructed since A.D. 1525 occur within the 20th century. Although extreme ENSO events are seen throughout the 478-year ENSO reconstruction, approximately 43% of extreme and 28% of all protracted ENSO events reconstructed occur in the 20th century. Of particular note, the post-1940 period alone accounts for 30% of extreme ENSO years noted since A.D. 1525. The image (click to enlarge), from the paper by Gergis and Fowler (Climatic Change (2009) 92:343–387, DOI 10.1007/s10584-008-9476-z), shows the distribution of ENSO events by century, from the 1500s through the 1900s. The intensity is classified by percentile: extreme (>90th percentile), very strong (70th–90th percentile), strong (50th–70th), moderate (50th–30th) and weak (<30th). Minnesota winters start early, but the low temperature of 36° this morning at Minneapolis marked the 16th day since the date of the average first freezing temperature. 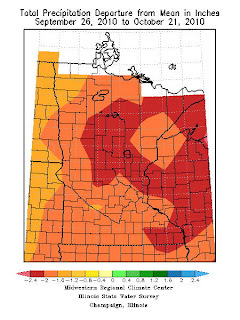 The Minnesota Public Radio Updraft blog noted yesterday that the average date of first 32° temperature in the fall is October 6. The latest forecast calls for temperatures to decline next week, but the non-freezing streak could complete a third week with the low not expected to reach 32° until Thursday, the 28th. This would be a tie for the 10th latest first freeze; the most recent occurrence was in 2007. Updraft notes that the trace of precipitation so far makes this the driest October on record, although the National Weather Service reports that is likely to change by tomorrow with a 60% chance of rain. The 27-day stretch without measurable precipitation since Sept. 26 is now the 8th longest dry spell in Minneapolis history. The longest was 51 days from Nov. 15, 1943 to Jan 4, 1944. Minneapolis records began in 1871. It's also the 8th longest dry spell on record at St. Cloud, where records date back to 1940. 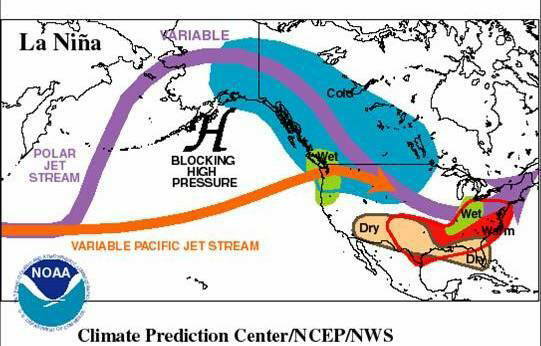 The unusually warm and dry conditions are the result of the jet stream remaining north of the region. The chart shows that the average jet stream for the past month has been mainly located over southern Canada. The winter weather outlook (December 2010-February 2011) released this morning by NOAA's Climate Prediction Center is dominated by the effects of a developing strong La Niña. Temperatures are forecast to be above the long-term average from the Ohio Valley through most of the Southeast and westward to the Rockies. The warmest area relative to average is predicted from southern New Mexico eastward through most of Texas and Louisiana. 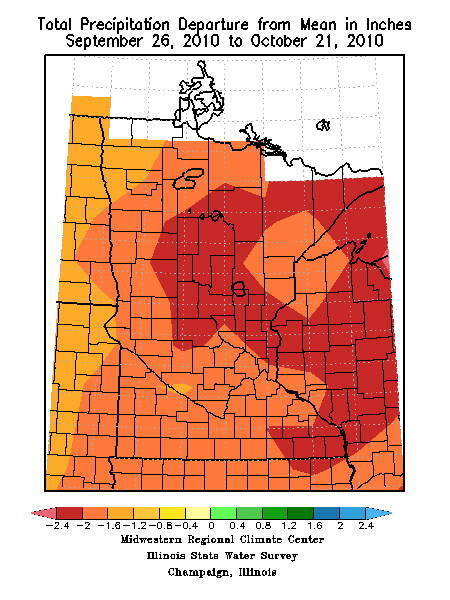 The only areas expected to be cooler than average are along the immediate Pacific Coast and eastward along the Canadian border to northern Minnesota. There are equal chances of above or below normal temperatures in the interior of the West and across the Great Lakes, Mid Atlantic, Northeast, and southern Florida. 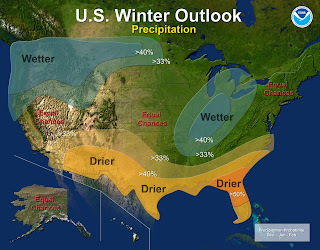 Precipitation is predicted to be above average in the eastern Great Lakes, Ohio and mid-Mississippi Valleys, and from the Pacific Northwest and northern California eastward across the northern Rockies. The wettest areas relative to average are likely to be the Pacific Northwest, northern Rockies, and lower Ohio Valley. Drier-than-average conditions are forecast along the southern tier of states from the Southwest eastward across the Gulf Coast to the Southeast, with the driest conditions through central and northern Florida. 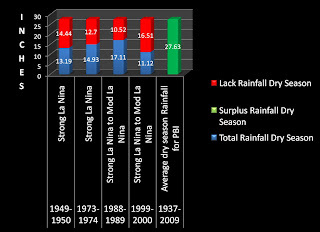 The National Weather Service chart of West Palm Beach precipitation, to the right, shows the drastic reduction of dry season rainfall during past moderate to strong La Niña patterns. 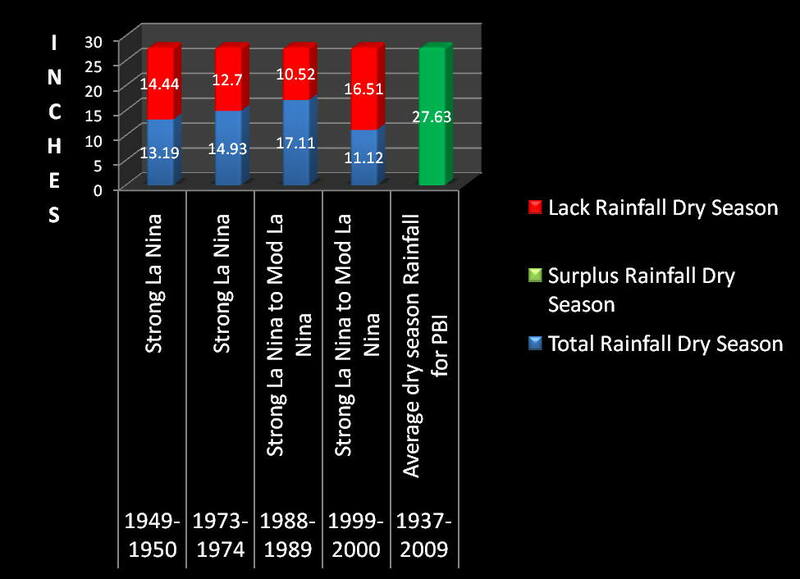 The red bars represent the precipitation deficit, and the green bar represents the climatological precipitation total. Equal chances of above or below average precipitation are expected from central and southern California eastward across the central Rockies and much of the Great Plains, as well as from the central Appalachians northeastward through the Mid Atlantic and Northeast. The seasonal drought outlook for the next 3 months (November-January) calls for persistence or intensification of drought conditions in the Southeast, but with improvement of conditions in more northern areas, particularly the lower Ohio Valley and Mid Atlantic. La Niña is defined by cooler than average sea surface temperatures in the equatorial Pacific Ocean. 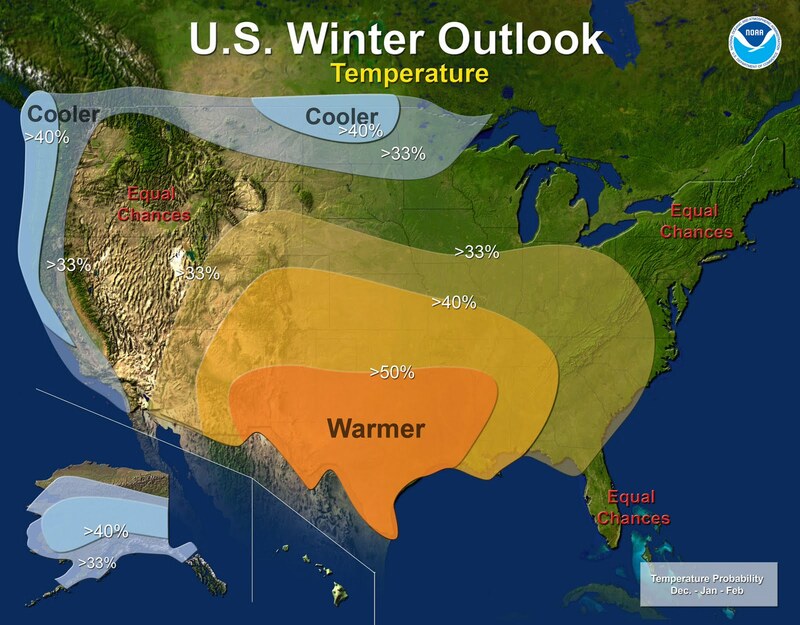 The current La Niña continued to develop during September, and the latest outlook calls for it to strengthen into the winter and continue through at least the spring.